To his credit, despite turning down funds available through the Affordable Care Act (or Obamacare) to expand Medicare, Governor Scott Walker managed to fill the insurance gap. In other states that refused the extra federal dollars, people whose income fell below the official poverty level but didn’t meet the income cutoff for their state’s Medicaid requirements–especially those with children–were left with no way to pay for medical care. Walker largely solved this issue by removing from Badgercare Wisconsin residents, mainly parents, whose income exceeded the Federal Poverty Level. This move was made possible by the ACA which made available subsidized insurance to low-income people whose income exceeded the Federal Poverty Level. Moving out people who qualified for the exchange’s subsidies made room for people who previously did not qualify for Badgercare—mainly adults without children whose income fell below the Federal Poverty Level. Many of these people were fully employed, but in jobs that paid poorly and did not offer health insurance. 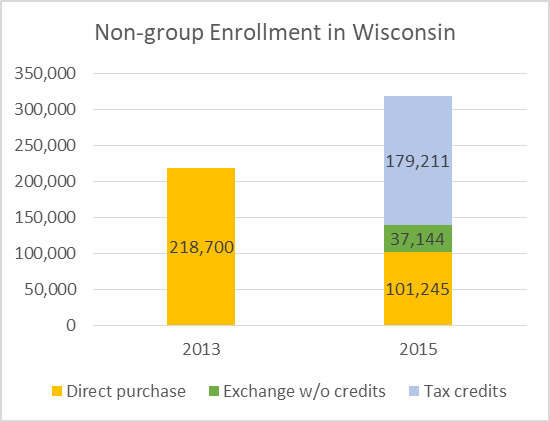 The next graph summarizes Wisconsin enrollment in 2013, before the ACA took effect, and afterwards, in Badgercare and individual (non-group) insurance. 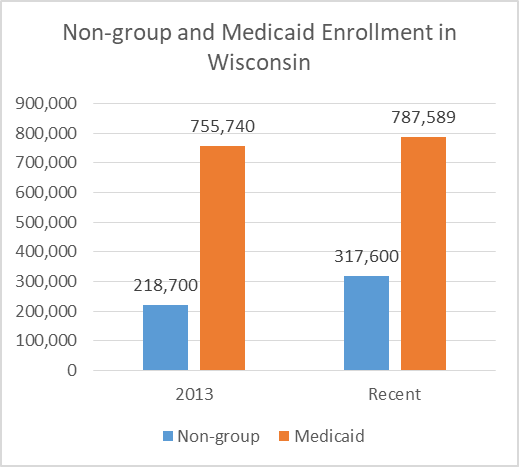 As can be seen, Badgercare enrollment grew, but only by about 30,000. Enrollment in the non-group market grew by about 100,000 in Wisconsin, cutting the number of uninsured residents by 130,000. The non-group (and exchange) estimates are from the Kaiser Family Foundation for 2013 and 2015. For Medicaid, the numbers come from the Wisconsin Department of Health and Human Services and run through this June. The graph below breaks down 2015 non-group enrollment. Most individual policies were purchased through the exchange, mainly by taking advantage of the federal tax credits. The big losers in the Walker plan were Wisconsin taxpayers. According to the nonpartisan Legislative Fiscal Bureau, this decision has cost them $679 million more than they would have paid under a full expansion of Medicaid. Walker’s approach is projected to cost an additional $150 to $200 million per year in the future. 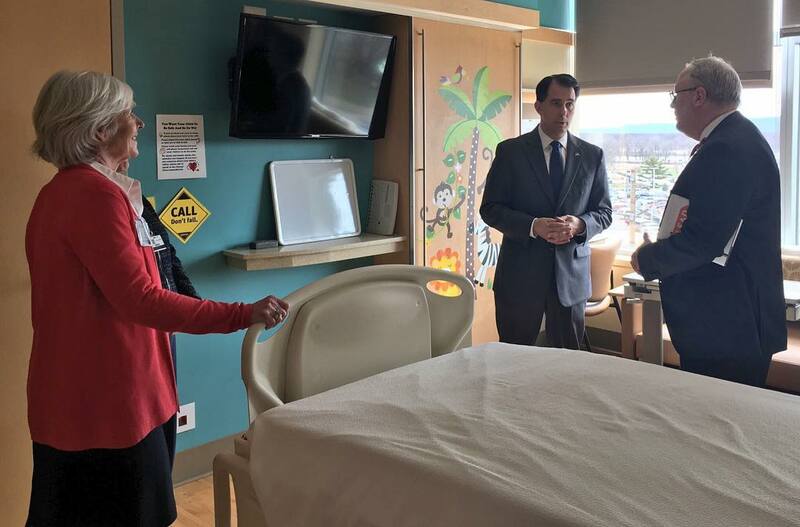 Walker’s stated reason for refusing the additional Medicaid dollars was uncertainty about whether they would continue in the future. His critics pointed out that no federal program was guaranteed to last forever, which did not normally keep states from availing themselves of federal offers. Politically, Walker’s strategy helped him with the Republican base that had been trained to hate Obamacare. Apparently it was willing to overlook the fact that Walker’s plan worked only because of the availability of the Obamacare exchange and its subsidies to pick up people forced out of Badgercare. Whatever the merits of Walker’s decision, recent political events offer an opportunity to reassess the relative vulnerability of Medicaid expansion versus the insurance exchanges. Medicaid expansion proved much more politically popular than many observers expected. One sign of this is how the various Republican ACA replacement proposals treated states that expanded Medicaid compared to those, like Wisconsin, that did not. The Missouri Hospital Association calculated that under the American Health Care Act, the bill passed by the House, federal spending on Medicaid in expansion states by 2025 would be $1,936 per capita compared to $1,158 in non-expansion states; in other words, expansion states would receive 67 percent more. Missouri, like Wisconsin, is a state that chose not to expand Medicaid. Under the Better Care Reconciliation Act, the first of several bills considered by the Senate, the Missouri report found that federal spending on Medicaid in expansion states would be $1,987 per capita by 2026, compared to just $1,192 in non-expansion states. Despite Walker’s entreaties that both groups of states be funded equally, non-expansion again would have received 67 percent less. It should be stressed that both bills vastly cut spending and enrollment in both expansion and non-expansion states. Still, it seems ironic that Wisconsin would have been hurt more under the Republican replacement plans because Walker rejected the Obamacare expansion. The difference was even more stark under the last of the Republican proposals—the so-called “skinny” replacement plan. Leaving Medicare expansion untouched, it would have eliminated the individual mandate while maintaining Obamacare’s ban on considering pre-existing conditions. This combination would likely be lethal to the non-group market. It’s now clear that two most important Obamacare components in reducing the number of uninsured were the Medicaid expansion and the exchanges, which were designed to allow the purchase of privately-managed insurance plans while receiving tax credits based on income. Of the two, the exchanges got the most attention, but Medicaid expansion played the larger role in reducing the number of uninsured. So long as the Republican alternatives to Obamacare aren’t resuscitated, Medicaid expansion seems far less vulnerable than the exchanges. To end it requires a change in federal law, something that turned out to be far harder than many expected. Unless the repeal effort is revived, states and providers can make decisions with some confidence the rules won’t suddenly change. With the exchanges, by contrast, there is considerable uncertainty, much of it caused by President Donald Trump, whose actions suggest he is actively sabotaging the exchanges and attempting to drive up their costs. First, the Trump administration’s removal of a question about medical insurance from tax forms leaves the impression the individual mandate is not being enforced. To the extent this encourages healthy people to skip buying insurance, this pushes up the average cost of insurance. A second way Trump creates uncertainty is by refusing to commit to making the so-called cost-sharing reduction payments. These reimburse insurers so they can charge low-income people less for medical treatment. The increased uncertainty seems calculated to lead insurers to increase proposed premiums for next year or drop out of the market entirely. This month a three-judge panel of the District of Columbia Court of Appeals ruled that states defending the payments could intervene in opposition to a challenge to the payments by Republican members of the US House. The court found that these states “have shown a substantial risk that… requiring termination of the payments … would lead directly and imminently to an increase in insurance prices, which in turn will increase the number of uninsured individuals for whom the States will have to provide health care. … In addition, state-funded hospitals will suffer financially when they are unable to recoup costs from uninsured, indigent patients for whom federal law requires them to provide medical care. … “. In a democracy, one dependable rule of thumb is that politicians go out of their way to protect their constituents. This makes the apparent determination of Trump and the Republican congressional leadership particularly puzzling. Before his inauguration, Trump promised the Affordable Care Act would be replaced with something much better. He promised “everyone will be taken care of” with “insurance for everybody.” He further promised “no cuts … to Medicaid,” “no one will lose coverage” and “nobody will be worse off financially.” Yet he enthusiastically endorsed proposals that would have ended coverage for more than 20 million people. Nor was Trump alone in this regard. According to estimates from the Kaiser Foundation the state that had the largest percentage decline in uninsured people under Obamacare was Kentucky. Yet one of its senators —Mitch McConnell—was the leader of the repeal effort and the other—Rand Paul–repeatedly complained the proposed bill was not draconian enough. The exchanges and the individual markets, by contrast, appear very vulnerable to presidential actions. Both not enforcing the individual mandate and reneging on the cost-sharing reduction payments are two strategies that will likely drive up premiums and reduce the number of policies in the individual market. This means that the risk Walker cited for not expanding Medicaid is reversed. The exchange part of the ACA is more vulnerable to the erratic Trump administration than the Medicaid expansion. Contrary to Walker’s argument several years ago, expanding Medicaid is not only better for Wisconsin taxpayers but is accompanied by less political risk. Walker made the wrong bet, and state taxpayers will pay the bill for this. Can you blame Trump for not funneling federal money to the private insurance companies that keep claiming they are not making any money . Could Nancy Pelosi and Harry Reid put together a better scheme to pay for the true costs of Obamacare. Obamacare is not being paid for by any regular means of taxation. It was purposely built to fail . President Obama also stated that the cost of medicine would go down under his plan and that illegal aliens would not be covered both not true. Walker’s logic makes sense as well. Why except a plan that overtime costs the state of Wisconsin more. Obamacare is covered by the federal government on about .63 cents on the dollar with Wisconsin picking up the rest but that drops in a few years. Troll has deep and complicated thoughts so let me see if I follow. Obama, Pelosi, and Reid are bad and to blame for everything rotten in life including every stubbed toe Troll has suffered. Trump and Walker are saviors and righteous men doing only good work. Someday they will be on Mount Rushmore. Got it. Makes you wonder why Obamacare is what 40% more popular than Trumpcare? Vince, Medicaid is the greatest threat to state budgets. Why can we not attempt to slow the growth? What is Trump care and how do you compare it to Obamacare? 40 percent? Please, explain to me what Trumpcare is? So Troll is fine with the old system of people being denied for pre-existing conditions, people having coverage dropped when they got sick, junk insurance policies that drove people into bankruptcy when they got sick, young people kicked off their policies when the reached 18, annual double digits increases in premiums, deductables and co-pays along with reduced coverage; not to mention 40-50 million people with no coverage at all and the thousands of annual resultant deaths because of it. They are truly out of touch with reality, or they just don’t care. I still don’t understand why they cling to the ideology that the “free market” alone can solve the problem when no other civilized (and even some not so civilized) industrialized country has had success doing it that way, and pay much less- often with better outcomes, than we do. In a democracy, one dependable rule of thumb is that politicians go out of their way to protect their constituents. Except we don’t have one of those and individuals aren’t the constituency. Vince, if you like your doctor you can keep him or her. Oh, and your health rates will go down. Tom why is Obamacare so popular? Why do so many people like it? Why does it poll so much better than Trumpcare? Vince, why do kids love free candy? Why do people love free lunches? How many people are actually happy with Obamacare that are paying for it? Medicaid is not insurance, nor is it being paid for by those using it. People getting tax credits are not actually paying their whole premium. How many people, that are paying their own premiums, without the luxury of tax credits and Medicaid like it?